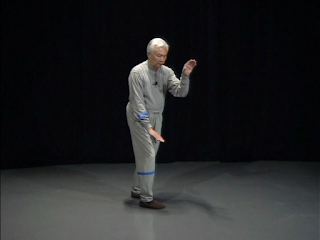 Master Hwas Square Form Instructions analyzed and excerpted here by Sifu Jim Roach.Students do these wrong and miss the martial intent and ultimate application of the movement: The "hand has to end up in line with the curve of the elbow" as in photo 3, otherwise, it is out of position to have intent on the fingertips thus able to strike upward to the throat. 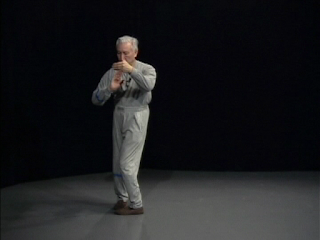 These 4 photos represent movements at the end of Posture 2 and the beginning of posture 3 of the square form. I see students get the position of the elbow wrong in the 3rd photo. They do not draw in the elbow by keeping it down but allowing it to rise to a right angle, sometimes to the level of the shoulder. One key is the right palm becomes centered, behind left palm but IT IS ALSO IN LINE WITH THE CURVE OF THE LEFT ELBOW, then after the shift of the body forward into posture 3, we can talk about "the right elbow pull slightly down and out, causing the right hand to slide slightly to the right"
Is this Yin/Yang symbol, a white figure on a gray figure or a gray figure on a white? Is this what one might call "ambiguous"? Yet, when not caught up in ambiguity we see a yin-yang "pair", clearly delineated. 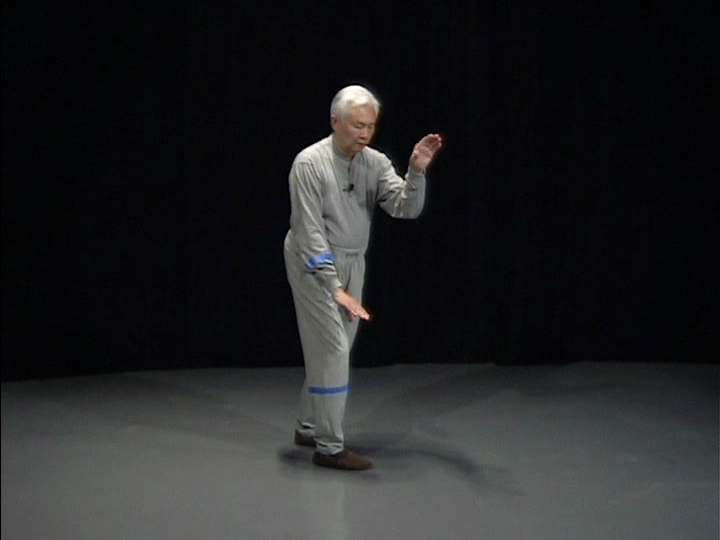 The Classical Tai Chi Square Form has this "delineation" as its primary purpose and it is our "template" for learning the "Round". This is necessary because most of us move instinctively, one might say "ambiguously". Most do not understand the fact that our bodies have segments, we are naturally segmented but have never learned how to use it. 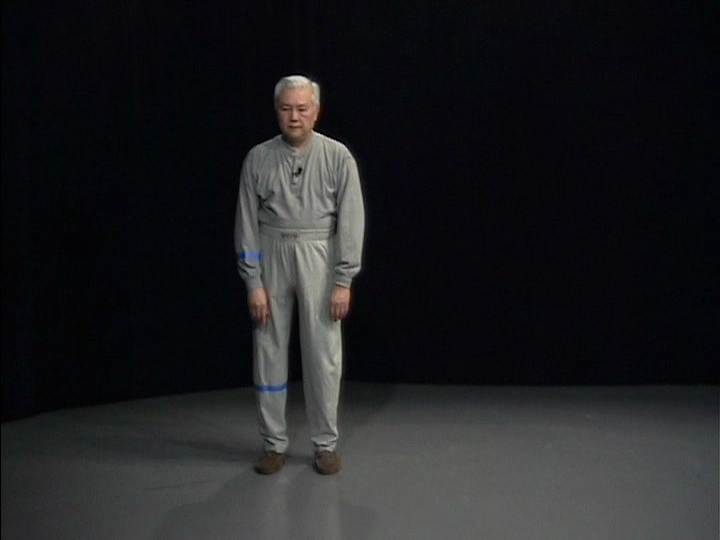 One part of the body moves, the other part is non-moving, this has to be taught to the conscious mind but as Stephen Hwa states in his book "Uncovering the Treasure", the subconscious also has its role: "We gradually absorb the essence of the forms and shapes we practice into our subconscious. Eventually, every move we make will instinctively follow the way." 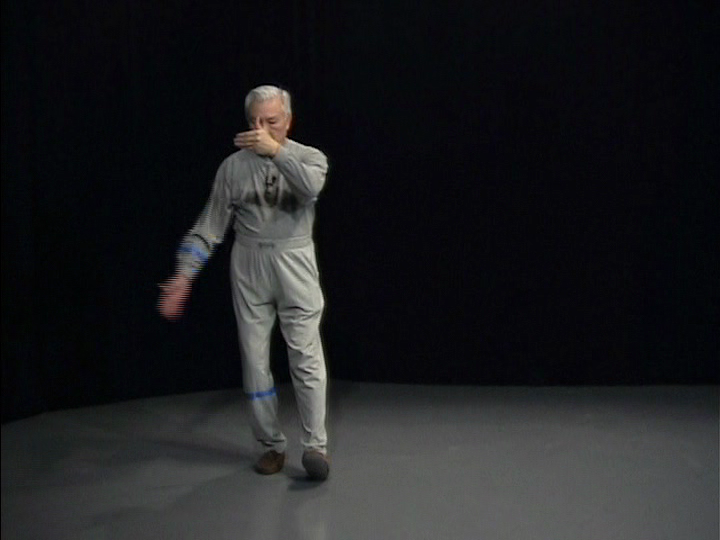 Note he says we will not continue to move instinctively, ambiguously but that the moves we make will "...instinctively follow the way..."
The simple movement of rotating the thumbs toward the body will cause the palms to face the rear. However, unless it is trained not to move, the chest will hollow as well. To the casual observer, nothing is happening here. This is where the integration of body and mind can consciously occur. Humans are complex beings, however, and so we need training and practice in integrating mind and body. This is where "ting jin" comes in and sensing of one's own movement before learning to sense the partners. Here's where I find a fascinating example of how the mind and body are not intrinsically integrated for even a simple movement. 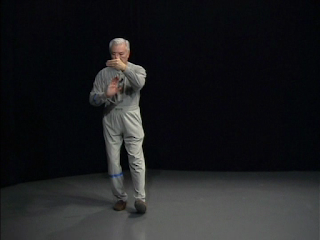 It also shows how to achieve integration in both simple and complex movement. The words "...when one part moves everything moves..." found as glaring error in the Tai Chi Classics is not integration of mind and body. 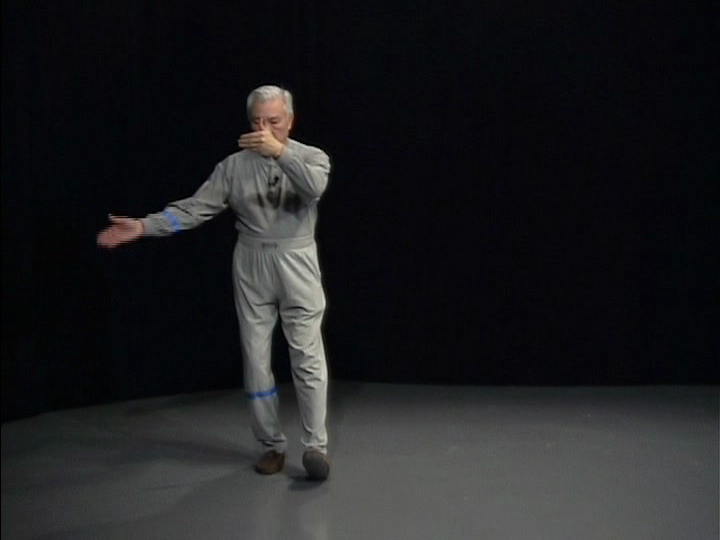 For how do you take a lack of consciousness in movement, lack of yin/yang delineation and turn it into a Tai Chi principle? 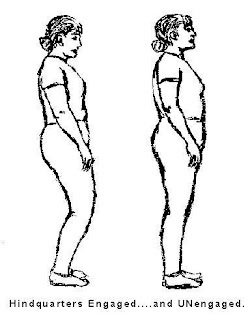 So you see it is a natural fact that if you move one part of the body, your body will always move another part extraneously unless your mind consciously intervenes. An overwhelming majority of people I meet are learning Tai Chi for something other than serious understanding of martial arts. 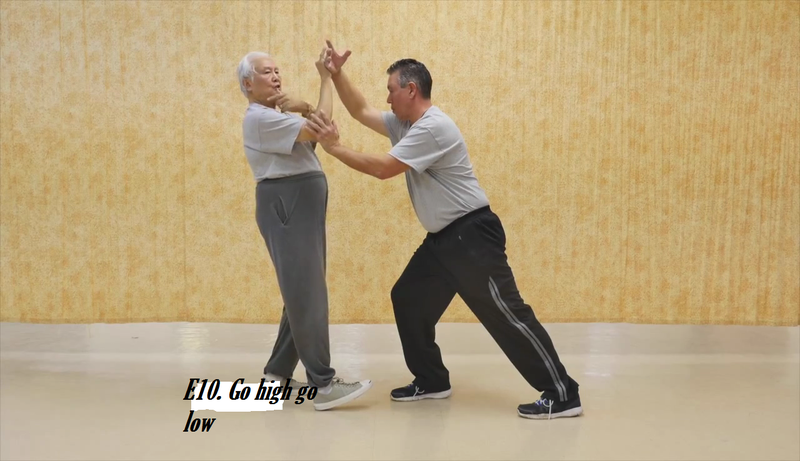 This is a good discussion on martial arts, ballet, dance, walking dogs and more from a student Barbara R :"I found Master Hwa's discussion of YI (martial intent) and cold hands and dancers' problems in taking up tai chi interesting because of my own experience. When I used to do ballet, the palm side of my hands and fingers would get very warm and flushed and so would my teacher's. As she was older and had high blood pressure and none of the other students seemed bothered by "hot hands," it really kind of worried me a little. When I started doing tai chi and found out warmth and flush and tingling in the hands could all be signs of chi flowing correctly ( Very true- Master Hwa), I was relieved in retrospect, but disappointed, because I didn't have any of those experiences playing the form. I thought maybe it was because of so much keyboarding in the years between—enough to cause some carpal tunnel syndrome problems. Then, in the last few months, I began to have some color and tingling while practicing and hoped it was some healing effect taking place, although I still have to use wrist braces now and then and curtail my activities a little. Master Hwa's piece offers another explanation. 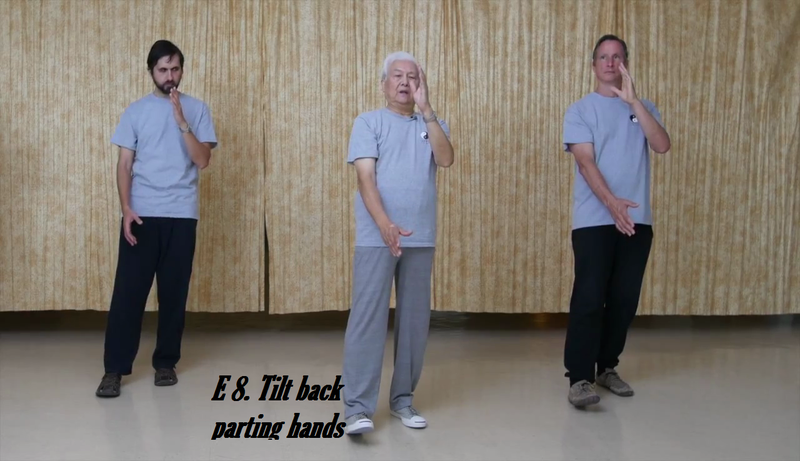 When I first started doing tai chi, I had no idea what most of the motions were for. Since then, I've learned a good bit more about applications and now often play the form to an audience of imaginary opponents "walking the circle" around me like ba gua players. (That is the way to practice- Master Hwa) This is actually much nearer the way I used to practice ballet--with the intent of expressing to an audience, real or imaginary, whatever character or emotion the dance I was doing was supposed to represent. Maybe one of the reasons I was drawn to Wu style was Wu Ying Hua and Wu Yan Hsia, although I'm not sure I knew about them until I got into it, just as I didn't know about Master Young's daughter until I found your website.The only difference any of this makes is that it can create a kind of little barrier that you've got to get over in your own mind. Punches still feel quite alien to me, although a "one inch" punch is certainly an improvement over a haymaker. I think the biggest help is to find something in the martial essence of tai chi that you can relate to and use it as a bridge to the rest. For me, maybe one of the best is something I read recently about peng ( I think you mean ting jin, which means listening to opponent’s jin(power). 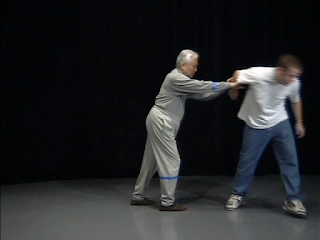 I will talk about this laterMaster Hwa) or which mean as an attitude that permeates tai chi and almost incorporates the "audible force" rather than as any specific action. I certainly ought to be able to relate to that, after spending so much time walking herding breed dogs off leash and having to "listen" to their muscle tension and for anything about to come our way so as to be able to "ward off" their attacks on cars and cats before they start. That may sound bizarre, but just as you mentioned applying the principles of tai chi to everyday life, I think you have to find your point of entry to a martial arts mindset,if it seems alien to you, wherever you can." Concerning the integration of Internal Discipline into Form Play. 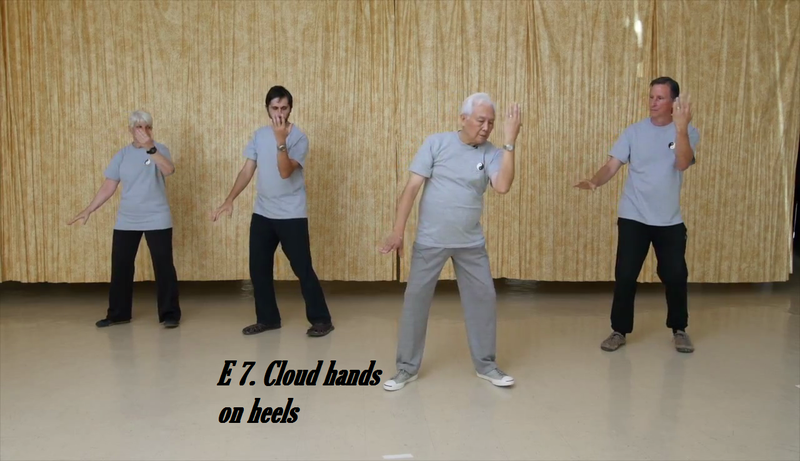 This cloudhands exercise just done on the heels is a great precursor to eventual integration of internal discipline with round form cloudhands... IF and WHEN there is good quality of round form. Students may be making good progress in the class but need to keep in mind there is a qualitative minimum before we worry about quantities. If we have good quality in our form and it is the standard, then moving often with internal discipline is within reach. 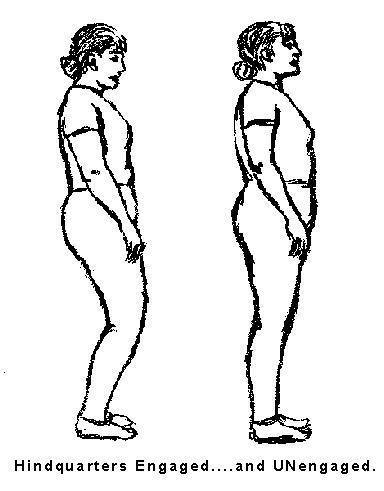 This is why it is so important to do internal movements, quarter body, upper body turn, etc. separate from form practice, LITERALLY ANY CHANCE YOU HAVE ANYTIME. Too often I see students attempting in vain to do internal in the form when they are constantly corrected for making mistakes like "wrong direction", "incorrect position of hands", "bad timing of movements". 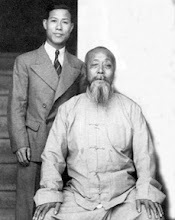 I understand this day and age is impatient for results but find a teacher that can thoroughly immerse you in the principles and explain those same principles behind all of this in Classical Tai Chi. Please keep all of these principles in mind and catch yourself when you try to force internal on a movement that is wrong in so many other ways. What is "small circle" Tai Chi, what is "internal"? http://youtube.com Besides my own personal study in the 70's, 80's and 90's for a considerable time at numerous locations, particularly Youtube. I did a search of all of myriad sources, websites, videos, images, articles for actual instruction on true "small circle" Tai Chi and I do not find "small circle" Tai Chi being taught. 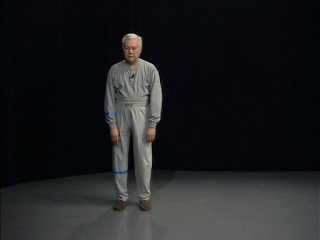 Although I saw the words "small circle" used quite frequently, a critical examination (with an accompanying comparison to Classical Tai Chi) of the body structure, foot positioning, size of footsteps, (in many cases "extraneous") movement of the extremities, and lack of "internal movement" from the core of the body, demarcation/delineation of yin and yang, positioning of yin/yang pairs, etc. revealed to me that there is no "small circle" Tai Chi being taught. This picture gives a good comparison of what is "small circle". 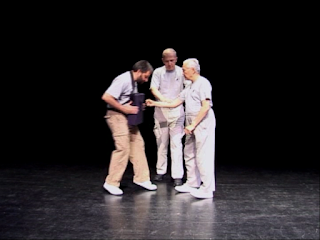 In the truest sense, saying one's Tai Chi is "small circle" is like saying their Tai Chi is "internal". Recently, a new student said "...internal is what my teacher is teaching in a particular Style short form.." yet I asked the student to show me their "internal" and they said"...well, that is what my teacher said he was teaching...". I think "caveat emptor" is particularly germane to what we discuss along with "all that glitters is not gold". wherein the attractive "external appearance" of something is not a reliable indication of its true nature. There will never be a digital version of "Uncovering the Treasure" coming to a Tablet, Cellphone or PC near you. 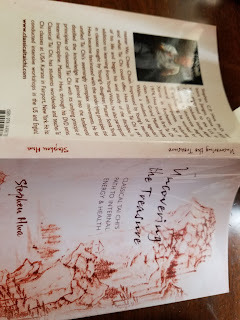 For one thing those electronic devices cannot "open and close the body along the spine" like this book can...for another that book smells so good when one's "nose is buried in it". Unfortunately batteries are not included with the book but you can smile when the flight attendant tells everyone to turn off their electronic devices. The book feels different each time, much like the Classical Tai Chi form. To paraphrase my teacher as well I think there will always be more books passed on to other people than tablets. 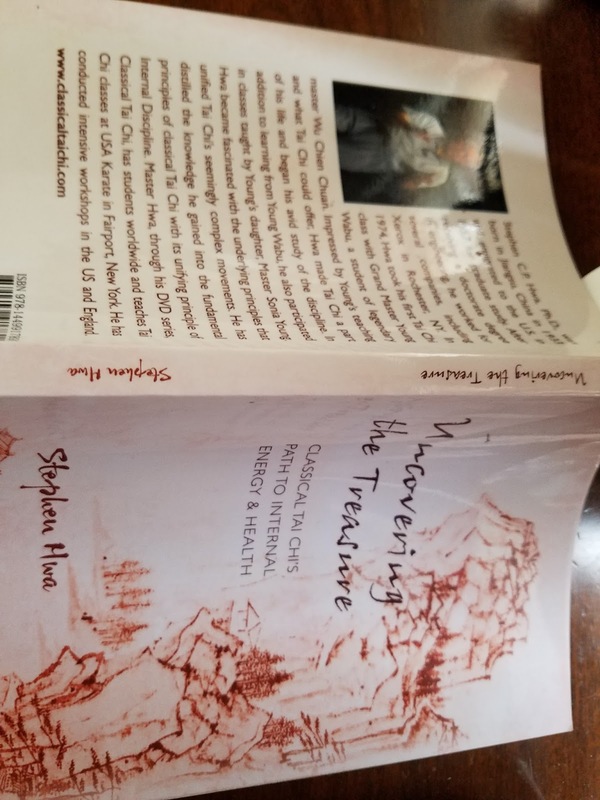 "Uncovering the Treasure" by Stephen Hwa, PhD available at Amazon. Let's not continue to conflate "fajin" only with "one inch punch" which time wise is of short duration. 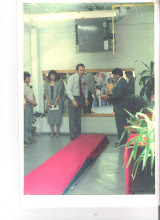 As you see in the photos which show "longer duration" and "short duration" of force. How do we do either or both? If there is a "secret" to success it is to be found by us in our discernment or non-discernment of small differences in sensation that we feel and our subsequent ability or inability to both note and choose options and movement efficiency. In a workshop Master Stephen Hwa said "...the amount of fajing you can deliver is proportional to how compact you can make the delivery..." AND as I have said "... It is an established principle that the smallest difference in sensation we can discern is proportional to the magnitude of the larger sensation..." The "larger sensation" for all of us is the much larger section of the body that is away from the much smaller area that we wish to move. IMHO: There are no "SECRETS" of Tai Chi, if you want to develop "one inch punch" in a hurryyyy, go home and do slowwww quarter body movement as a punch for 2 hours a day for a hundred days. The thing is there are slim and none people willing to do that...the "secret" is in sheer persistence for a "short duration" of time. Or you can do it spread out over years as a "long duration" with the same persistence.